High Level Puzzle and Seating Arrangement Practice Question Based on Floor Arrangement and Some Facing Inside -Outside Circular Arrangement for IBPS PO, Clerk SBI PO, Bank PO/Clerk, RBI Exam and Other Bank Exams. 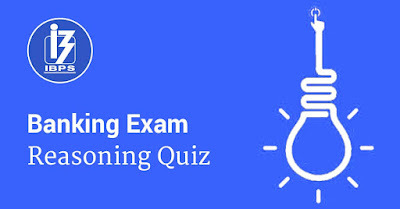 Puzzle and Seating Arrangement in Reasoning Ability section of Bank Exam is very Important. These Days Around half Questions come from Puzzle and Seating Arrangement in Bank PO and Clerk Prelim & Mains Exam. Directions (1-5): Study the given information carefully and answer the following questions below. There are eight professors - P, Q, R, S, T, U, V and W who live on different floors of an 8-floor building numbered 1 to 8. Each of them teaches different subjects viz. Economics, History, Political Science, Geography, Physiology, Genetics, Physics and Bio-Chemistry, but not necessarily in the same order given. The ground floor is numbered 1, the floor above is numbered 2 and so on, and thus, the topmost floor is numbered 8. There are two floors between W and the professor of Geography. The one who lives on the lower most floor is neither a professor of Economics nor Political Science. P lives above R’s floor. U neither the immediate neighbor of R nor a professor of Political Science. None of the Science subject professors lives on or below 3 numbered floor. S who is a professor of Bio-Chemistry, lives on an even numbered floor but not above R’s floor. Neither W nor V is a professor of science subject. There is one floor between W’s floor and V’s floor. R lives on an even numbered floor. There are two floors between P’s floor and the professor of Genetics. Q-1. Who is the professor of Economics? Q-2. How many floors are there between Q’s floor and U’s floor? Q-3. If T does not live on an odd numbered floor then, what is the subject of T? Q-4. What is the subject of that professor, who lives between U and S? Q-5. Who stay between the Q and T? Directions : Study the given information carefully and Draw the Circular Seating Arrangement Diagram. D is sitting fourth to right of B. The person who likes Yellow sits second to right of D. A is sitting third to right of C.There is one person sitting between A and B. A does not like Yellow color. Three persons sit between the person who like Yellow and Pink color. The person who likes Green color sits second to right of person who like Pink color. D does not like Green color. The person who likes Blue sits third to right of person who like Green color. C likes Blue color. There are two persons sitting between D and E. There are three persons between the person who like White and Black color. E does not like White and Black color. There is one person sitting between the person who like Black and Red color. The person who likes Yellow color sits third to right of person who like Red color. The person who likes Grey color sits third to right of person who like Black color. G sits fourth to right of person who like White color. F is not immediate neighbor of G. The person who like White color sits third to left of person who like Yellow color and both faces the same direction. (Same direction means if one faces center then other also faces the center and vice-versa).E faces opposite the center. A likes the Pink color.